With splash fountains, outdoor café tables, an amphitheater and public restrooms, Hilliard’s Station Park is the perfect location for community events. Check out the events calendar for upcoming activities in Old Hilliard. Located at the beginning of the seven-mile Heritage Trail, Hilliard’s Station Park marks the location of an old railroad station and Hilliard’s original town square. The park boasts distinctive architectural qualities that reflect its rich history in the community. Celebration at the Station runs June through August every Thursday evening. Rocking with our summer concert series, Celebration at the Station features live bands. All concerts are from 6:30 through 9 PM. Food trucks and Old Hilliard restaurants are available for dining pleasures. Adults 21+ can participate in DORA. Motivation at the Station runs from June through August. Work out and have fun during Saturday mornings in the summer with our yoga and fitness series. Featuring local instructors, this event is great for your body and mind. Classes start at 8:00 AM and are 50 minutes long. This is a free class! Sprouts Night Out is a summer event that happens in June and July. Families can come and enjoy a fun night for the whole family. With live music, kids activities, and food trucks, it’ll be an unforgettable evening! Event runs from 6:00 to 8:30 PM. 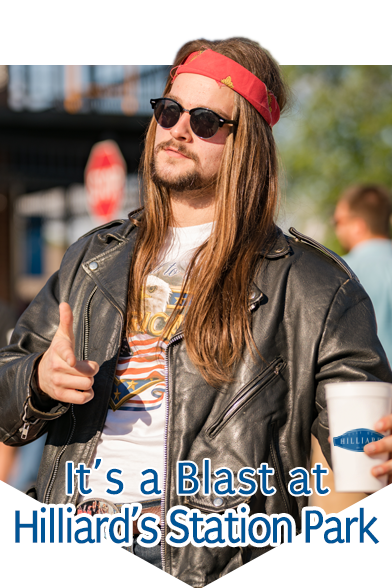 Residents age 21+ may purchase and carry alcohol within a designated outdoor refreshment area (DORA) at Hilliard’s Station Park during Celebration at the Station. To participate, purchase an alcoholic drink from one of the vendors listed below and enjoy it outdoors within the DORA boundaries. Alcoholic drinks must be served in designated plastic cups. No cans, glass bottles or outside drinks are permitted. With splash fountains, outdoor café tables, an amphitheater and public restrooms, Hilliard’s Station Park is the perfect location for community events. Rental fees for Hilliard’s Station Park include 5 round tables and 40 chairs. The building does not come equipped with running water/sink area, refrigerator/freezer, or Air Conditioning. The glass garage style doors do open if you wish to do so. The staff is not responsible to restrict the public from entering your event space. You can learn about renting a facility here. A minimum of 2 hour reservation is required. Events exceeding the time allotted for the reservation will be charged at one and a half times the hourly rate until the Facility is vacated.